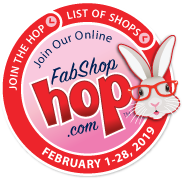 Mr. Bunny is anxious to see what is COMING SOON to Quilters Candy Shoppe. Let him show you what he found. We have a new group on Facebook that you might want to join - it's our QCS Marketplace. We feature many of the items we have in the store and in our webstore. We run specials from time to time. The only way to know about the specials is to be a part of the group. We're glad you popped in for a visit. We have lots to share with you so grab your drink and start browsing. Our goal is to be your first and last stop when shopping online (or in our shoppe)for quilting supplies. If you have any questions we are only a phone call (402-336-1953) or an email away. Don't be a stranger! There's always something happening here online and in our shoppe.